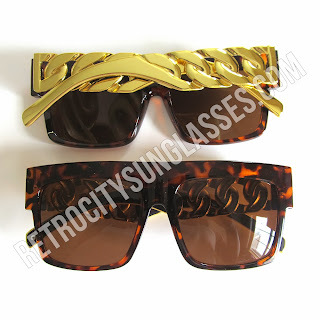 Tortoise Brown Chain Sunglasses are one of the hottest celebrity sunglasses of 2013. These sunglasses are favorites of Rick Ross and Kim Kardashian. Chain Sunglasses in Tortoise Brown feature arms that look like chain links. Does it get any better than that?? Seriously! These hyper glossy sunglasses are must for anyone that appreciates trendy looks. You could literally step out in a white tee, destroyed denim jeans, and Chain Sunglasses in Tortoise Brown and still look the business! That's all it takes! A lot of the time, sunglasses can really make the outfit. And Tortoise Brown Chain Sunglasses are just the accessory you need to give you that trendy and edgy look.